Renowned Hawai‘i Island veterinarian (and distinguished author) Dr. Billy Bergin has been a leading influence on the paniolo traditions and practices of our Islands throughout his long career. His work in the Paniolo Preservation Society in Waimea, and his impact on ranching and rodeos, has earned him nationwide acclaim in the world of the cowboys and their horses. 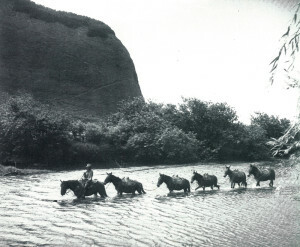 We who love Hawai‘i and its equines are in for a real treat, as Dr. Bergin reviews the history of the Hawaiian horse, including the descendants of those animals brought from California to Hawai‘i with the caballeros who would teach the Hawaiians a new trade and introduce them to the trappings of the cowboy. On the biological side of things, he presents a DNA analysis of feral horses and donkeys in the Islands, talks about the mystery disease that is currently affecting the feral horses in their Waipi‘o Valley home, and reviews the research efforts being made to cure or prevent this disease. Join us for a powerhouse presentation which reaffirms the position of the Hawaiian Horse in Hawai‘i’s rich heritage, on either of two occasions: Monday evening, October 1, or the following afternoon, October 2.